Theme to be introduced in the second quarter of 2016. Posted by NovaHawk (administrator) on 21 June 2015 at 00:38. Edited by NovaHawk (administrator) on 2 July 2015 at 00:36.
Who flies with slingshots up in the trees? Bright colored, grumpy, and angled are these! Then drop from the leaves and fall on your head! 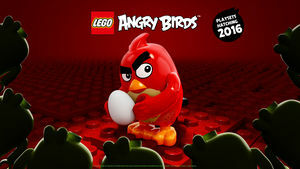 Angry Birds are coming, and we have a teaser from Kotaku. Look, an egg. That should be really useful for...eggs. It doesn't seem to have any connection points. If you want a minifigure to hold it, you'll need to give them that beautiful birdie's arms...seems like a combo made in heaven, to me. This teaser also, quite clearly, confirms playsets. Surely you could have figured that out for yourself, but pointing out the obvious is where reporters like me excel. According to Kotaku, the poster will be on display at the LEGO booth at next week's San Diego Comic-Con. Oh, and those green things surrounded our feathered avenger would seem to be pigs, and they have regular arms. Posted by NovaHawk (administrator) on 2 July 2015 at 00:36. What's better, Mega Bloks or LEGO?